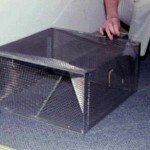 SNAKE TRAP LARGE 18" X 16" X 8"
WHERE TO USE IT: These traps are best to use outside. It can be set along waterways such as streams and rivers. You will also catch snakes along fence rows, retainer walls or against the foundation of any home or building. RATE OF APPLICATION: As many as needed. Generally, the more traps you have out at any time will enable you to catch more over a shorter period of time. All sizes can have their entrances adjusted. Simply cut the wire cone entry hole to widen it for thick snakes. If needed, you can always thread it back together with thin wire. Comments on SNAKE TRAP LARGE 18" X 16" X 8"
I was finally successful in trapping a brown water snake using this trap–YAY! It did take a bit of effort, though. He did not just slither in using the snake lure & small unfortunate live fish. I managed by catching it resting in my skimmer box & moving the trap to its opening. 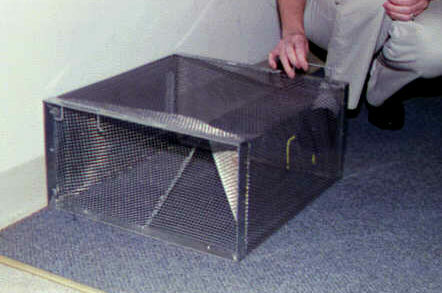 But once in, this trap is study, easy to transport and convenient to release the catch. For me, this is a great investment as I'm pretty sure I'll have another uninvited guest in the future. SNAKE TRAP MEDIUM 18\" X 12\" X 8\"